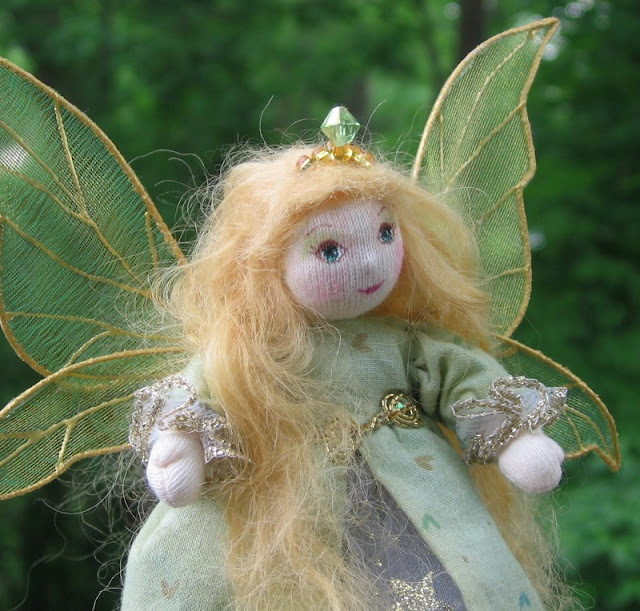 The Fairies Nest - OOAK Cloth Dolls & Fiber Fantasies: Wing Tutorial at Last! I promised this tutorial ages ago and since I was making a pile of wings this week, I decided now was the time. "Pile of wings"...hmm...is there a collective noun for a group of wings? Ack, I've been distracted by my inner word geek...back to the tutorial. Now that you have your tools assembled let's go! The first thing you need is a wing design. Now take your wire and shape it to the outer lines of your pattern. Twist the ends together at the base of the wing and leave a tail. Easy peasy! How long of a "tail" depends on what type of doll I'm making. For the small dollhouse size pixies I need about 3" so I can wrap it around the doll. Now paint the wing on both sides with the textile paint and let it dry. I like to use an egg carton with small holes punched in the bottom for my drying rack, it works great! When the wings are dry, you'll need to cut a piece of the sheer fabric. Cut it bigger than the wing on all sides. Now put your wing on a piece of wax paper. Once you've finished gluing all your wings, place another piece of wax paper on top and then weight them all down with a heavy book or two...at last those high school year books come in handy! You'll need to let these dry for 4-6 hours and then open the wax paper and give them an additional 30 mins or so. The glue needs to be completely dry. Okay, now it's time to cut away the excess fabric from the outside of the wing. Be patient and cut carefully, right next to the wire. If the fabric is not sticking in any areas apply a tiny bit of glue and press together with your fingers; let dry again and then trim. The next step is to mark the veins on the wing, this is why you needed a reverse pattern. I do this in pencil, but it depends on the fabric, a dark silk may require a white marking pen. Now for the tricky part. You can use the tip that is already on the dimensional paint but I just don't think that they have a fine enough line. I switch out the tip on the bottle for a one of these in a size 5. This makes a very fine line. Hold the wing slightly up and go carefully here when applying your lines as it's easy to make a mistake. If you really mess up you can blot the wing with a wet cloth, let it dry, and start over. When you're done place the wing in a slightly bent position to dry. You don't want the wing lying flat at any point in this part of the process as the paint will soak through and spread. Once the wings are dry, which takes about an hour, you're ready to go! I hope this is helpful, please ask away in the comments section if you have any questions. What a fantastic tutorial! you would not believe how many failed attempts I made to make fairy wings when I was younger. I really enjoyed this tutorial. Gorgeous!!!!!!!!!!! 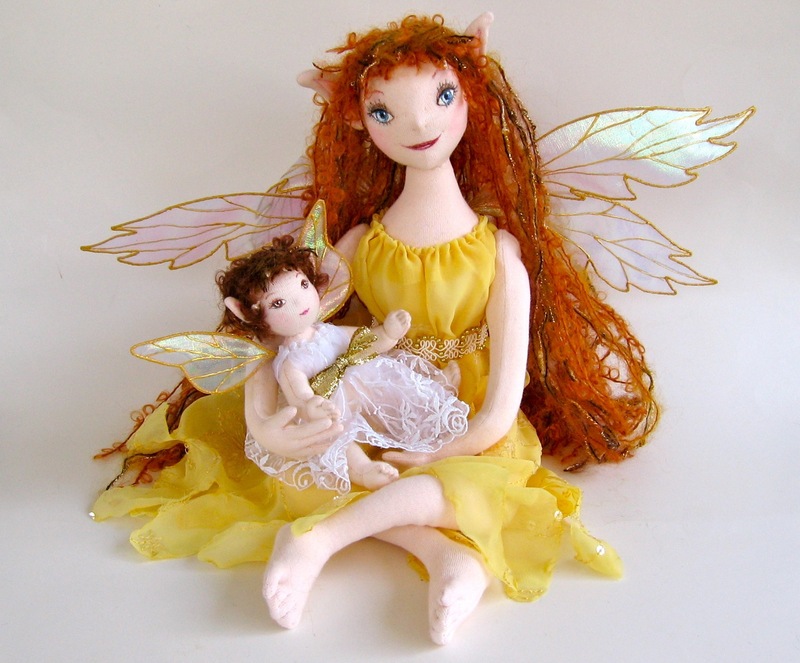 Your dolls are beautifully whimsical and magical! You should have seen the tiny little broom Bruce made for a Chris Van Allsburg project (The Widow's Broom)- it was perfect and tiny! Reminded me of you! Wow! What great information! I'm sure my daughter would love to know how to make fairy wings! I'll have to share this with her. Wonderful! Thank you so much for a great tutorial! Cynthia I love your tutorials, everything is so clearly defined and it is so generous of you to share your techniques, thank you! what a beautiful tutorial! it will come in very handy for the fairy doll swap I'm hosting right now! FaeCyn, Wow! You have such lovely posts! So inspiring, the doll and wing tutorials...if only I had the time and patience for such handwork! Hey! You have just received an award on my site! :-D I think your blog is wonderful! OMG...this is awesome! Thank you so much for the tutorial. Thank you for this it's a great tut!!! Neat! Cool to know. They're so shiny and sparkly. Thank you very much, for sharing this tutorial! I am looking forward to giving this project a go, sometime later this week. Thank you for this tutorial, it's the best one and makes so much sense that I can actually follow it and make wings from! I have just read through your tutorial and have to thankyou for your genorosity in sharing it with us. Your dolls are truely beautiful! I sure wish I had read this totorial before I worked for 2 hours on my organza wings. GRRRR!!!! I have been wrapping the excess organza around the back of the wing to secure it even after I glued it to the back. Wow. How easy is yours. Will try again, this time with your instructions. Do you recommend any specific glue for securing the wings tightly? Thanks so much for your willingness to help. Love your fairies. God bless. I am so sorry to drive you nuts but I bought white floral wire today and it did not have a gauge on it. It is very flimsy. How tough is the wire you use? I don't want to start wings and have it been super easy. Could you let me know? I have been tempted to go by the 20 gauge green wire, paint it and see how that works. Please let me know. Thanks so much . WOW! I almost burned up my pumpkin bread, I was so absorbed in your tutorials. Thank you for sharing your techniques and helping to improve doll-making for us all. I can't wait to make something! Beautiful technique; thanks for sharing! Thank you soooo much for your fairy wing tutorial! I have been looking for an easy but realistic pattern, and this is it! You are very welcome Pam! I'm so glad it was helpful. Fantastic tutorial. I am going to combine this with some of Di van Niekerk's ribbon embroidery techniques for flower fairies. She always uses solid (needle painted) moth-style wings for her fairies, and I really wanted the option of transparent wings for some of the Cicely Mary Barker designs. Now (thanks to you) I can do this! Really appreciate you taking the time to explain your technique - your fairies are gorgeous.Thank you so much! A wish come true; I've looked all over. Would you please share the method you use to attach these lovely wings to the fairy body? Thank you for sharing your method on how to make these fairy wings .I've been looking for ways to make them and this is really helpful . Thank you so much! I'm really happy this helped! THANK YOU !!!!!!!!! This is great. I can't wait to try. so easy.....many thanks to you. This is so perfect thank you so much! What a great idea I am going to make some wings and add them to my fairy cards.